Chelsea failed to make use of a dominant start as Marco Silva's half-time team talk worked wonders. 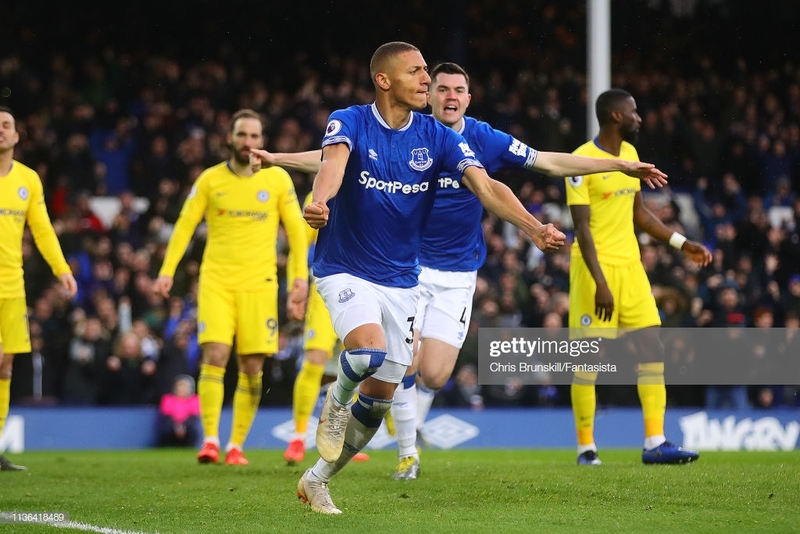 Everton triumphed in a game of two halves at Goodison Park as Richarlison and Gylfi Sigurdsson helped conclude a good Sunday for Merseyside with a 2-0 victory over Chelsea, just the club's second in 11 Premier League encounters. The Toffees started the game slowly and could've been a couple of goals down at the break, but held on and Richarlison punished Maurizio Sarri's side just four minutes into the second period. Sigurdsson's penalty rebound 20 minutes from time sealed three points as the visitors showed a dismal lack of ambition to respond and remain outside the top four with no games in hand. There were celebrations in the Goodison concourse beforehand as Ryan Babel poked Fulham level against Liverpool at Craven Cottage, but the boos for Ross Barkley were unsurprisingly louder ahead of kick-off. The home crowd were silenced early on though, with Eden Hazard looking as lively as ever on the left flank. Six minutes in, he entered the box from the left, with Everton defenders happily backing off, before Jordan Pickford, featuring in his 100th Premier League game, got down well to stop a drilled effort at the near post. Chelsea had hit the woodwork 19 times this season, more than any other top-flight team, and the Belgian made it 20 two minutes later. Hazard moved inside from the left and curled a 20-yard effort off the base of the far post - Pickford was beaten and the home side rattled. Everton may have cleared their lines but Chelsea applied instant pressure. Gonzalo Higuain took the ball into his stride well behind the defence and scuffed his effort beyond Pickford eight yards out, but Michael Keane retreated and just diverted the ball off the goal-line. The visitors continued to dominate the ball and showed brief signs of 'Sarri-ball' as the half continued, making use of Everton's poor ball retention, but the hosts were presented with a glorious chance to take the lead just past the half-hour mark. Marcos Alonso was booked for tugging Richarlison's shirt down the right and Sigurdsson stood over the resulting free-kick. The whipped cross was inviting and met the free head of Dominic Calvert-Lewin 15 yards out, but he found the wrong side of the crossbar. Barkley was then given a good chance to silence his critics five minutes before half-time, as Richarlison received a booking of his own for sliding in on Hazard just outside the box. The former Everton man was happy to take it but fired straight into the wall, leading to a predictable reaction from those in the Howard Kendall Gwladys Street End behind. Chelsea thought they had taken the lead at a perfect time with half-time moments away as David Luiz' precise through ball over the top found its way through to Pedro, who took it well and fired into the roof of the net at a tight angle. However, the linesman's flag denied them the opener at it remained 0-0 after the opening 45 minutes. Whatever Marco Silva told his players in the dressing room worked like magic and the Toffees created more chances in the opening 90 seconds of the half than they did in 45 minutes. First, Calvert-Lewin drove down the right and his powerful cross caused Luiz more problems than it probably should've done. Bernard was charging into the box at the back post but the ball just evaded his touch. A lively start to what turned out to be a perfect half. Next, it was Andre Gomes who applied the pressure and ultimately set the move for the opener in motion. The Spaniard dummied into space around 25 yards out from goal and pinged his effort towards the top corner, which Kepa Arrizabalaga was level to and palmed out for a corner. Sigurdsson delivered and Calvert-Lewin easily beat Luiz in the air but his header was palmed out by Kepa before Richarlison reacted to the loose ball first and headed home from close range. Chelsea just can't keep clean sheets away from home at the moment, and that was the first goal scored against the Blues at Goodison in five league games. Pickford continued his strong showing on the hour mark as Higuain picked the ball up 20 yards out and fizzed a goalbound half-volley. The England no. 1 got down well again to palm away with a strong hand. That would be his last contribution as he left the field with Barkley - who made sure to sarcastically applaud the Everton fans as he departed to a chorus of boos. It was the supporters who had the last laugh though when Alonso, who had another off-day, clumsily floored Richarlison on the right side of the Chelsea box and gave referee Anthony Taylor no choice but to point to the spot. The ever-reliable Sigurdsson stepped up, saw his penalty saved well to Kepa's right before calmly slotting in the rebound and sending Goodison into raptures. Theo Walcott came on midway through the second half and has found the net at all four grounds he's faced Chelsea on, and very nearly made it five with 10 minutes left. The ball was played through and he found himself one-on-one with Kepa at a tight angle, however, didn't hit his left-footed effort with much venom and the Spanish goalkeeper gratefully claimed. Callum Hudson-Odoi showed plenty of energy, as usual, after being introduced late on and forced Pickford into a strong save with a fizzing effort from the left flank. Shortly after, the full-time whistle was blown and put an end to another forgettable away trip for Chelsea. The thought of still having to go to Old Trafford and Anfield across Stanley Park won't be a pleasant one, you'd think. Going into this one, the Toffees had not beaten one of the established top-six sides in the top-flight since January 2017, drawing seven and losing 18, but valiantly put an end to that dire run today. That's four losses from the last five away games in the Premier League for Chelsea now, conceding 14 in those four defeats. The Blues form on the road will have to pick up if they are to avoid Europa League football for a second straight season. What now for Sarri and Co.? Everton are now just one point off the top half of the Premier League - a realistic target from another average season - after this first home victory in more than two months. Chelsea trail Arsenal in fourth by three points and on goal difference, and face a tricky run-in. You've got to wonder; is it time for Sarri and Co. to start prioritising the Europa League in order to secure Champions League qualification next term?